Available later this summer, the Fat Tire boot features a Michelin sole, Goretex upper and Boa closure (click to enlarge). 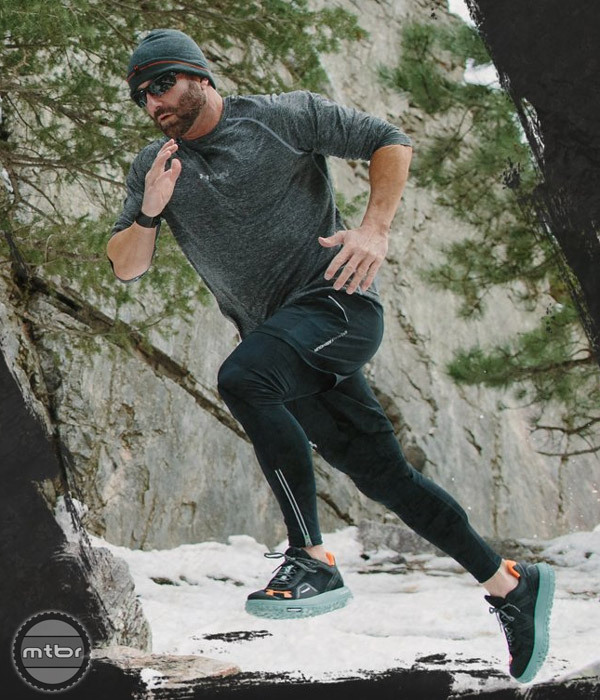 Under Armour is well known for their line of athletic base layers, shoes and other fitness apparel. Now they are blending that with some inspiration from mountain biking. They have a new line of shoes called the “Fat Tire”. It will be interesting to see just how well these hook up in the snow (click to enlarge). 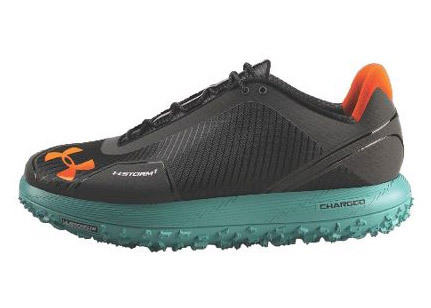 We don’t have a lot of details about this shoe right now, but the sole is easily recognizable by most mountain bikers. 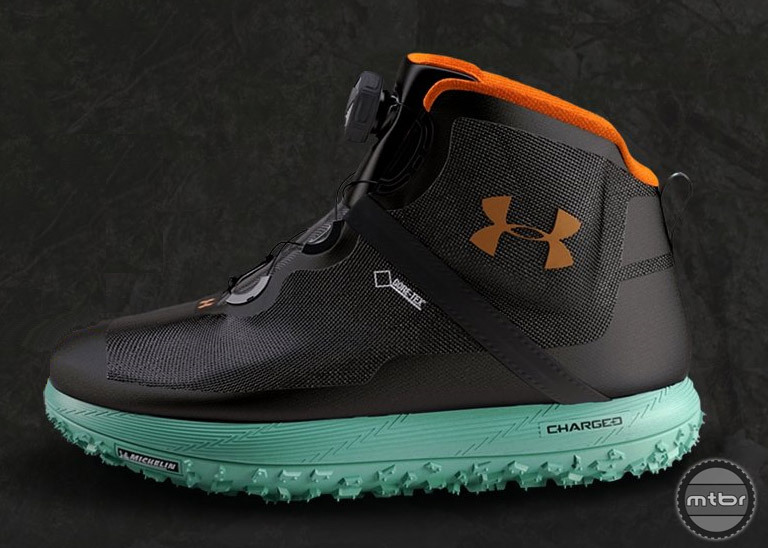 Under Armour partnered with Michelin utilizing the same green color from their Wildgripper line of tires. They claim that the outsole has a traction pattern that provides “excellent cross-slope grip and optimum all terrain traction”. The boot upper is made of a textile fabric with a Goretex membrane for waterproofness. A Boa closure should provide easy cinching of the boot even with gloved hands. Besides the black color shown here, there will also be a camo version. The Under Armour Fat Tire boot is expected to start shipping in late summer and will be available in half sizes from 8-12 and size 13 and 14. The MSRP will be $199.99. There is an online retailer taking pre-orders for a sneaker version of the Fat Tire shoe that has a suggested retail price of $149.95. The sneaker version is expected to be available sooner than the boot, possibly as early as June. We’re not entirely sure what to make of this shoe, but if your local fat bike rides include hike-a-bike sections through snow, the Fat Tire boot just might be a good option. A lighter, cheaper option to the Fat Tire boot, this sneaker version will retail for $149.99 (click to enlarge). To sign up for more information visit www.underarmour.com. 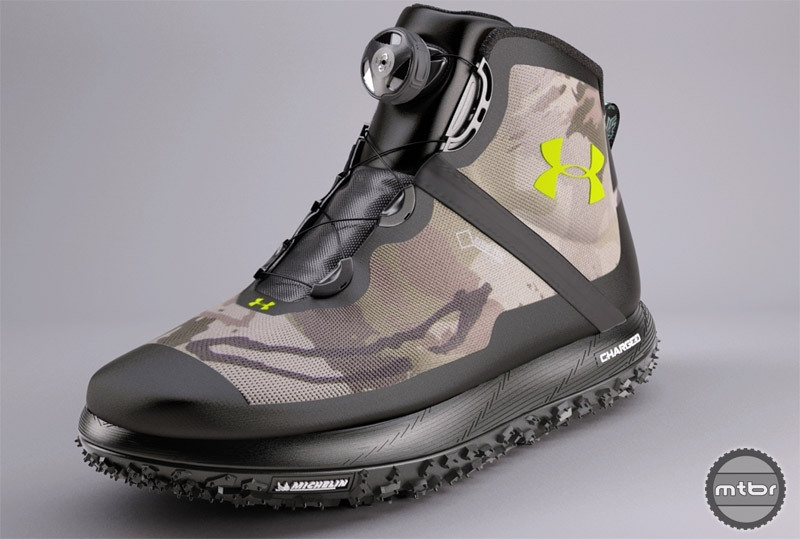 The new Under Armour Fat Tire boot will also be available with a black sole and camo upper (click to enlarge). It will be interesting to see just how well these hook up in the snow. Available later this summer, the Fat Tire boot features a Michelin sole, Goretex upper and Boa closure. A lighter, cheaper option to the Fat Tire boot, this sneaker version will retail for $149.99. The new Under Armour Fat Tire boot will also be available with a black sole and camo upper. Naaaa. An accurate tribute to fat bikes would be if they were more like big fat snowshoes with big spongy rubber soles, like squishy waterbeds under your feet. And yeah, they’re fugly. These are only compatable with 700C+ and 650B+ mountain touring bikes. What exactly are these boots for?